As reported, the four finalists of Rising Star for Israel will perform original songs on in the final on the 3rd of March. 100 songs were submitted and three have been chosen by an internal selection. Among the songwiters are Doron Madaly who wrote Israel’s 2015 entry Golden Boy. Israeli news site Mako has revealed the titles and writers of the three songs which will compete for the ticket to represent Israel at the 2016 Eurovision Song Contest in May. 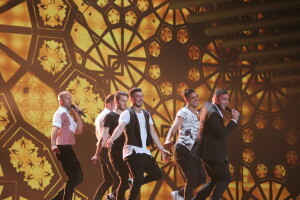 The finalists Hovi Star, Elle Daniel, Nofar Salman and Gil Hadash each chose one of the three songs to sing in the final. Both Hovi and Nofar chose Made of Star, but they will sing different versions of it. Ella Daniel chose Somebody Out There and Gil Hadash chose Follow the Sun. The final show of Rising Star for Eurovision will air live on the 3rd of March. Viewers at home will be able to vote through a designated smartphone app and the winning song and performer will represent Israel in Stockholm in May. While waiting for the 2016 Israeli entry, let’s take a look at some of their Eurovision highlights in recent years.